Two years ago, the former "The Voice" contestant sang for us at the Fusion and Univision studios. The music world is mourning the untimely loss of former "The Voice" contestant Christina Grimmie. She was only 22 years old. Here at Uforia Music we are reminiscing that time two years ago when the talented singer visited the Fusion and Univision studios in Miami. Humble, warm and bubbly as always, she played for us a few songs on her keyboard and spoke with our Fusion colleagues. During the interview, Grimmie spoke about her rise to fame on YouTube, where she started posting cover songs as a teenager. "I wasn't trying to [go viral.]. Sometimes when people don't try that's when things happen and you develop a fan base," she said. Back then, Grimmie was on tour opening for Selena Gomez. She described Gomez as "really down-to-earth," adding "She hasn't changed a bit, which is...that's how I want to stay. She's a good role model." 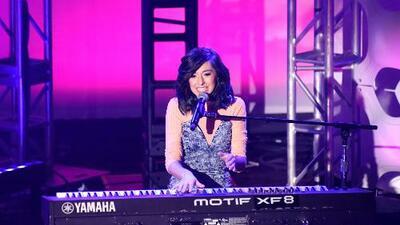 Grimmie also spoke about her biggest passion: singing. "I'm a big fan of live singing. I look up to people like Celine Dion, Christina Aguilera, and they sing live...that's what I love to do," she said. And that's how she will be remembered.